We describe a method using targeted peripheral irradiation to induce fatigue-like behavior in mice. The selected non-lethal irradiation dose leads to a week-long reduction in voluntary wheel-running activity. Cancer-related fatigue (CRF) is a distressing and costly condition that often affects patients receiving cancer treatments, including radiation therapy. Here we describe a method using targeted peripheral irradiation to induce fatigue-like behavior in mice. With appropriate shielding, the irradiation targets the lower abdominal/pelvic region of the mouse, sparing the brain, in an effort to model radiation treatment received by individuals with pelvic cancers. We deliver an irradiation dose that is sufficient to induce fatigue-like behavior in mice, measured by voluntary wheel-running activity (VWRA), without causing obvious morbidity. Since wheel running is a normal, voluntary behavior in mice, its use should have little confounding effect on other behavioral tests or biological measures. Hence, wheel running can be used as a feasible outcome measure in understanding the behavioral and biological correlates of fatigue. CRF is a complex condition with frequent comorbidities, and likely has causes related both to cancer and its various treatments. The methods described in this paper are useful for investigating radiation-induced changes that contribute to the development of CRF and, more generally, to explore the biological networks that can explain the development and persistence of a peripherally-triggered but centrally-driven behavior like fatigue. Cancer-related fatigue (CRF) is a distressing and costly condition that often affects patients receiving cancer treatments1. The fatigue is neither proportional to recent activity nor alleviated by rest, and it is associated with a wide variety of disturbances related to mood, motivation, attention, and cognition2. The biological causes of CRF are unknown, though it has been shown in many cases to correlate with inflammation and cytokine levels, also in some cases with hemoglobin levels and the function of various hormone systems (see Saligan et al.3 for a review of biological studies of CRF). Controlled studies using animal models are necessary to understand the behavior and biology associated with this complex condition. While tumor-related4 or chemotherapy-related5,6 fatigue has been studied in rodent models, the etiology of CRF may be treatment-specific. To investigate CRF related to radiation therapy, our group has recently developed a mouse model of irradiation-induced fatigue7. In contrast to existing CRF models involving brain or total body irradiation8,9, this model explores how a change in centrally-driven behavior, like fatigue, can be triggered by a peripherally-targeted irradiation procedure. The procedure described here is designed to model radiation therapy administered to patients with pelvic cancer, using lead shielding to target the lower abdominal/pelvic region with irradiation. However, by modifying the lead shielding or its placement relative to experimental animals, this procedure could be adapted to model irradiation of other parts of the body. Voluntary wheel-running activity (VWRA) is used to measure fatigue-like behavior; because it's a voluntary and normal behavior10, it should allow the concurrent use of other behavioral and biological tests. We have found that peripheral irradiation is sufficient to reduce VWRA in mice without causing overt morbidity7. Future experiments with this model may help reveal effects of peripheral irradiation on immune and other biological signaling, as well as the downstream changes in the central nervous system that can produce deficits associated with CRF. Ethics Statement: This study was approved by the National Institutes of Health (NIH) Animal Care and Use Committee. All investigators taking part in animal handling and measurement of study outcomes were properly trained by the NIH Office of Animal Care and Use and the National Heart, Lung, and Blood Institute Murine Phenotyping Core. All aspects of animal testing, housing, and environmental conditions used in this study were in compliance with The Guide for the Care and Use of Laboratory Animals11. NOTE: House male C57BL/6 mice (roughly five weeks old upon arrival) individually throughout the experiment and provide ad libitum access to food and water. All cages are kept on a 12:12 h light-dark cycle with the light phase beginning at 6 am and dark phase at 6 pm. Identify the mice and assign them to individual standard ventilated mouse cages. Allow 24 h after the identification procedure for recovery. NOTE: Tail tattoo is recommended as a means of identification to eliminate the possibility that an ear tag could get caught in a running wheel. Tattoo a number on the tail of each mouse, with the number on the tail matching the number written on the mouse's cage. Allow mice to acclimate to their cages for at least three more days, handling each mouse gently for a period of three minutes per day. Introduce the mice to individual VWRA cages, each equipped with a running wheel connected to an electronic counter for continuous recording. NOTE: All wheel counters connect to a computer through a single USB interface (see Materials List). The computer software calculates the number of wheel rotations, distance traveled, and average speed across each designated time interval of the specified total duration. Once the recording stops, the data are automatically saved both as text and as spreadsheets. Initiate recording of VWRA through the computer software interface. Set recording intervals to one hour and the duration to at least five days. Continue recording VWRA for at least five days. NOTE: At the end of step 2.2, all mice should achieve a relatively consistent amount of daily wheel running activity. If not, then identify and exclude any outliers. Stop VWRA recording through the software interface, and return the mice to their standard cages described in step 1.1 (cages without running wheels). Randomize mice into either sham-irradiated control or irradiated groups. Note: Perform the following steps for all mice in both groups, once per day for three sequential days. Treat mice in the same order each day. Anesthetize each mouse by intraperitoneal injection of a ketamine (100 mg/kg) and xylazine (10 mg/kg) mixture. Confirm anesthesia with a toe pinch and use ointment on the eyes to prevent dryness while under anesthesia. Transfer the anesthetized mouse into a lead shielding device. Arrange the mouse in the shielding so that only the lower abdominal/pelvic region is exposed. NOTE: The shielding is composed of two lead "boxes," with a narrow open space in between that allows radiation exposure to a small, targeted region of the mouse (see Figure 1). Use medical tape to secure the base of the mouse's tail in position within the shielding. NOTE: Step 3.4 is optional, but doing so can help ensure that the position of the mouse does not change during the following step. Transport the shielding device into the irradiator, ensuring that the animal position within the shielding is maintained. If the mouse is in the irradiation group, deliver 800 cGy at a dose rate of about 110 cGy/min. If the mouse is in the sham-irradiation control group, leave the mouse in the inactive irradiator for the equivalent time. NOTE: Optimal irradiator settings will depend on the particular device. The dose rate of 110 cGy/min delivered from a 137Cesium source is the central dose rate of the irradiator used here. The exposure time was adjusted to reach the desired total dose of 800 cGy. Remove the mouse from the irradiator and shielding, and then return it to its original, standard cage mentioned in step 1.1. Continuously monitor the mouse until it has regained sufficient consciousness to maintain sternal recumbency. On the day after completion of three successive days of irradiation, transfer the mice to their individual VWRA cages described in step 2.1. Record VWRA, as described in step 2.2, except here setting the recording duration to more than 15 days. At the end of the 15 days, manually stop VWRA recording through the software interface. NOTE: The data from each recording period are automatically saved as spreadsheets, each of which includes the rotation, distance, and speed measurements for all animals (columns) and at all intervals (rows) throughout the duration of recording. At the end of the experiment, there are two spreadsheets generated by the recording software: one for the pre-irradiation VWRA, and one for the post-irradiation VWRA. Three batches of mice were run through the protocol described above. There were a total of 16 sham and 20 irradiated (2,400 cGy, 3 x 800 cGy/day) mice. After three consecutive days of irradiation, the irradiated group showed significantly reduced VWRA compared to sham (mixed repeated measures ANOVA: main effect of irradiation treatment, F1,13 = 19.233, p < 0.001). The effect was significant for the first seven days after irradiation (simple main effects, p < 0.05 with Bonferroni correction), with the lowest mean VWRA distance occurring on the third day after radiation (Figure 2A). On days 25 and 26, no data were collected due to other behavioral testing. Figure 2B shows the distribution of the change in VWRA from before to after irradiation. While the majority of mice tested showed fatigue-like symptoms (a reduction in wheel running activity), there was a small number of mice that showed little change or even an increase in VWRA (Figure 2B, lower plot). Due to this variability, experiments with small sample sizes may not capture fatigue-like behavior. Figure 1: Lead Shielding Apparatus. 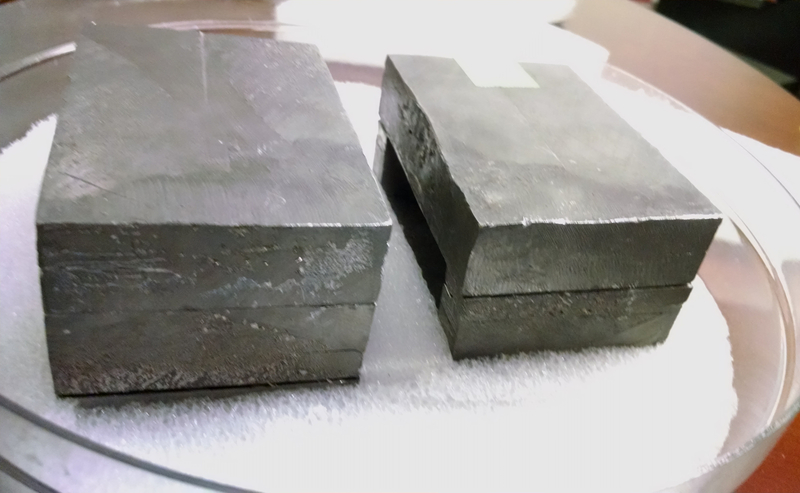 The shielding, which was developed in-house, is assembled as two identical boxes. Mice are placed with only their pelvic region exposed in the gap between the lead boxes. (A) A photograph of the shielding in its container. The lead boxes are surrounded by polystyrene foam to hold them in position, which is surrounded by the 10.5-inch diameter plexiglass container that was designed for the irradiator. (B) Schematic of the lead shielding. 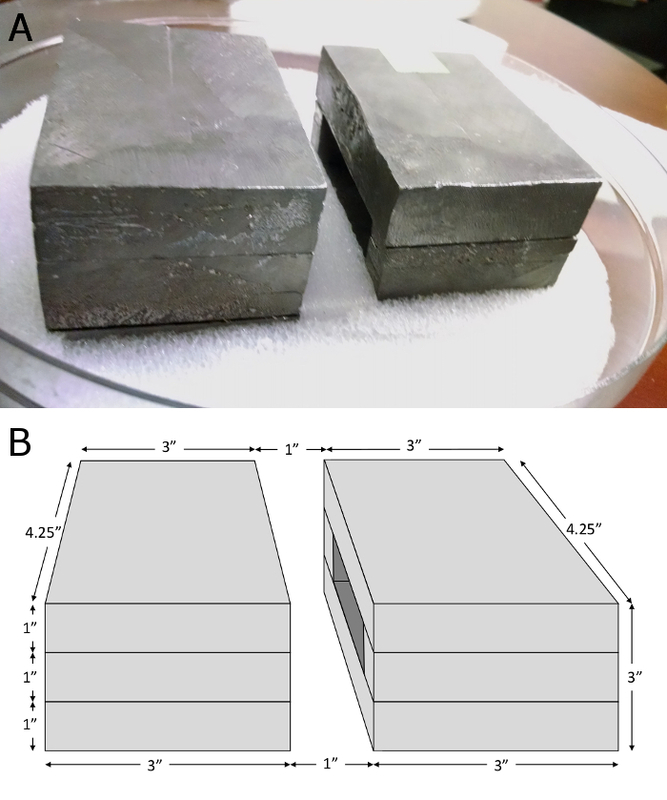 The lead shielding is comprised of 1-inch thick blocks of lead arranged as two boxes. Each box is made up of four pieces: the top and bottom pieces are 4.25" x 3" x 1", while the side pieces are ~ 0.5" x 3" x 1". When assembled, the outer dimensions of each box are 4.25" x 3" x 3", and there is a 1" gap between them. Please click here to view a larger version of this figure. Figure 2: Daily Voluntary Wheel Running Distance. (A) Average total distance run by mice each day (n = 16 control, 20 irradiated). Mice were irradiated on days 14, 15, and 16. On days 25 and 26, no data were collected due to other behavioral testing. Error bars show standard error of the mean. *p < 0.05. (B) Histograms of the change in VWRA, defined here as the mean of the three days immediately before irradiation (days 11 - 13) minus the mean of the three days immediately after radiation (days 17 - 19). Positive numbers indicate a reduction in VWRA. Please click here to view a larger version of this figure. We have described a protocol using targeted peripheral irradiation to induce a reduction of VWRA in mice without confounding morbidity or mortality. Importantly, a simple shielding device allows irradiation in this protocol to target a desired region consistently, mimicking the radiation treatments received by patients with pelvic cancer. In contrast to existing CRF models involving brain or total body irradiation8,9, this model explores how a peripherally-targeted irradiation procedure can affect centrally-driven fatigue behavior. In our representative results, we show that peripheral irradiation delivered in this way is sufficient to produce fatigue-like behavior with a complete recovery roughly one week later. As a measure of fatigue, VWRA allows for simple and objective assessment of distance and speed for 24 h per day, requiring minimal training and experiment time. It does require housing mice in individual cages, making facility space a possible limiting factor. While individual housing may affect mouse behavior, possibly leading to anxiety12 or hyperactivity13, there is evidence that wheel running may reduce these negative effects14. Wheel running behavior has also been shown to have less intra-mouse variability and greater reproducibility than other assessments of physical activity15. However, it is possible that physical fatigue may be more selectively captured in ways other than voluntary activity, since voluntary activity may depend on motivation or factors other than strictly physical fatigue16. Further experiments would be necessary to make such a determination. However, there are several points within the protocol which are critical for success. It is important that mice are allowed time to recover upon arrival in a new facility, and that handling be carried out during this period as noted. These procedures reduce stress and anxiety, which can affect voluntary activity17. Maintaining complete anesthesia during the irradiation process is also critical, not only because being constrained within closed spaces (the lead shielding) can be a significant stressor for the animals18, but also to avoid unnecessary exposure of other organs/tissues to irradiation. It is therefore important to ensure that the dosage of the anesthetic is adequate for the age and strain of mice before starting the irradiation portion of this protocol. Additionally, the acclimation of mice to running wheels for a minimum of five days is critical to obtain stable behavior before irradiation and suitable data for analysis. To troubleshoot unusual VWRA numbers, the VWRA cages should be regularly monitored for potential problems. For example, if bedding materials become piled up on or directly beneath the wheel, or if the running wheels are not sufficiently clean, this can add resistance to the wheel spinning and reduce activity level measurements. Additionally, since most wheel running occurs during the dark hours7, VWRA can be sensitive to fluctuations in the light cycle, and care should be taken to keep light cycles regular and uninterrupted. This protocol can accommodate the usage of different levels of irradiation. For example, we described three days of dosing with 800 cGy in this protocol, but we have seen slightly lower levels of fatigue using three days of 600 cGy dosage7. 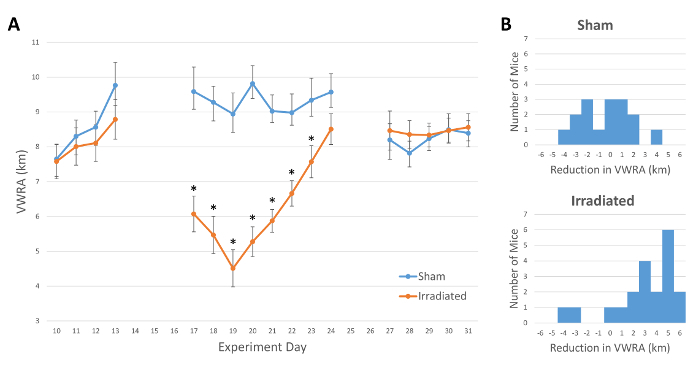 The effects of a particular irradiation dose will depend on the strain of mice19, the dosage rate of the irradiator20, the fractionation over multiple days21, and likely the size of the region exposed beneath the shielding. Single doses of 1,000 cGy whole-body irradiation have been used in C57/BL6 mice without increased mortality22, but precautions should be taken to ensure that high doses of radiation do not produce any signs of morbidity. Besides radiation dosage, several other steps can be modified to suit the experiment at hand. By modifying the lead shielding or the animal's placement within the shielding, these methods could be adapted to target other body regions with irradiation. However, changes to the shielding device should be validated with dosimetry to ensure that irradiation does not penetrate the shielded area. This protocol could also be adapted to incorporate a wide variety of behavioral measures, as voluntary running activity would not preclude behavioral experiments that are more physically or mentally demanding. For example, CRF often occurs along with cognitive deficits3; future experiments could explore the role which radiation therapy may play in this association. The presence of wheel running activity must be taken into consideration when performing the additional behavioral tests, as VWRA can affect physiology and behavior in many ways16. With irradiation doses of 800 cGy or less, the mice should not need special care after recovering from anesthesia. However, the irradiation procedure and resulting fatigue may potentially interact with other interventions such as additional behavior tests or pharmaceutical treatments. The animals should be monitored closely on the days immediately after irradiation whenever altering or adding to this described procedure. Different strains of mice may also show different sensitivity to irradiation19, so caution is warranted when using strains other than C57BL/6. While this technique is designed to represent radiation-induced fatigue, it is only one component of the complex CRF concept. CRF is a condition that likely has numerous causes and occurs in patients that have cancer and often receive multiple treatments. An understanding of CRF may therefore require sets of experiments with tumor-bearing mice and with other treatments such as chemotherapy or hormone therapy. Incorporating these variables into biological and behavioral tests will permit researchers to identify their contributions to this complex condition. The mouse model described here may help understand the specific role of radiation in CRF and develop potential therapeutics. This research was supported by the Division of Intramural Research, National Institute of Nursing Research, National Institutes of Health. The authors would like to thank Michele Allen of the National Heart, Lung, and Blood Institute (NHLBI) of the National Institutes of Health (NIH) for generously sharing her expertise in murine phenotyping methods and for her ongoing technical assistance, as well as for Timothy Hunt of NHLBI for helping us develop the shielding device. This study is supported by the Division of Intramural Research of the National Institute of Nursing Research of the NIH, and part of the validation trial is supported by a grant from the Oncology Nursing Society Foundation.